Now no more copy-pasting into text files or all-purpose notebooks. 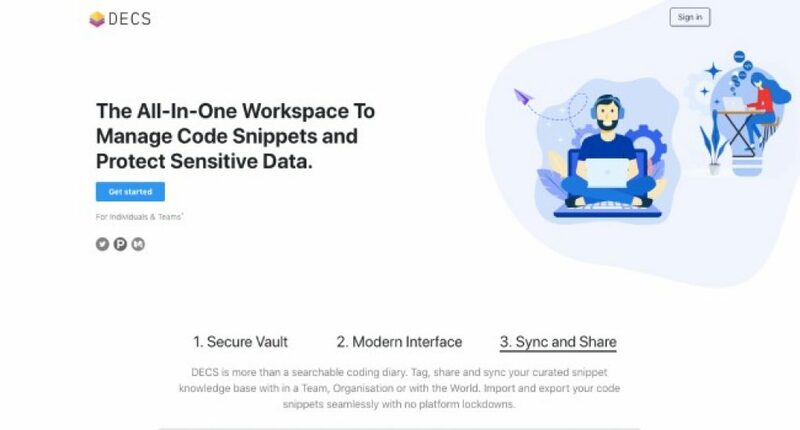 With DECS browser extension (coming soon), using single-click, capture the snippets that catch your eye and store them forever for future use. DECS uses BlockStack Naming Service to preserve user Identity with an underlying blockchain technology which means your data is end-to-end encrypted with keys that you alone hold. Not even we could see what’s in your workspace. Engage with your peers, colleagues, students and public – Teach and learn best practices, tricks and tips and new ideas by sharing examples from your snippets knowledgebase. Try it now; It’s Secure, and it’s Free! What problems does DECS solve? You can store, secure and tightly control access to proprietary snippets, tokens, configurations, certificates, and other sensitive data all in one workspace. Even the DECS team could not see your data, leaving you with peace of mind. 1) Security – Unlike traditional apps we use BlockStack Naming Service (BNS) to preserve user/domain identity with an underlying blockchain technology. BNS binds user identity to off-chain state without relying on any central points of control thereby the risk of DDoS or spoofing attack is reduced. 2) Reliability – Your data is end-to-end encrypted with keys that only you hold. You will have full control over who has access to your snippets. 3) Decentralized – We provide all our users, a default storage hub where your encrypted data can be stored for FREE. You can always relax knowing your data is end-to-end encrypted with keys that only you hold. Optionally, you can choose where to store your data, whether on a cloud provider (AWS/Azure/GCP) of your choice or your own personal server. 4) Accessibility – DECS comes with an intuitive UI to create your own snippets or seamlessly import snippets from other platforms such as Github or Bitbucket. Also, you can export your data at any time – no platform lockdown. I am Chandu from DECS team. I started this as a side project, and now it has grown into a three-membered group. We are located across three continents with our full-time jobs, but we spare our free time developing the product and doing a bit of outreach. We specialise across multiple domains ranging from DEV Ops, Backend to Frontend and with a bit of designing touch. DECS is launched back in December 2019 and by far we have around 200 users on the platform with very positive feedback. In the era of constant cyber attacks and data leaks, tools such as DECS who offer end to end encryption is of prime importance.